We offer Cotton Rope to our valuable customer and our product is made of good quality. Nylon Rope offeredcome in high finish strength and also provides for superior impact resistance and wear resistance. 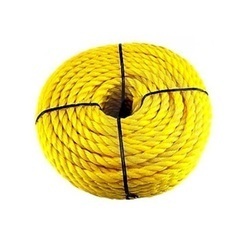 We can offer these ropes in different diameter options of 4 to 94 mm or as specified by the customers. Some of its features include 3 strand construction finish; available in white, yellow and other color options; suitable for industrial and civil works; choice of development as per OEM specifications as demanded by the customers.